The kiln (SD 342789) is situated on private land on the Holker Estate, and should not be visited without permission from the Estate. 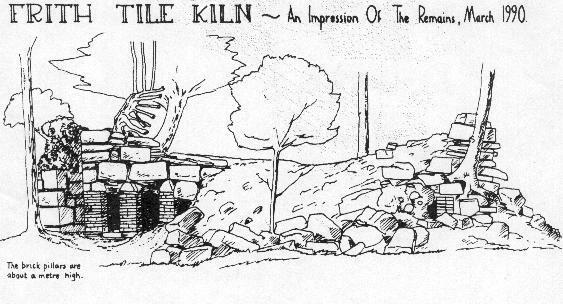 The remains of the kiln were obvious (1989 survey). It was a substantial structure, built of very large blocks of dressed limestone. 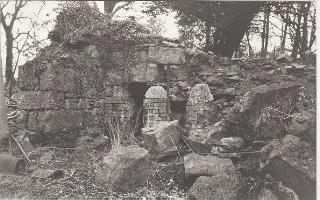 Although partly fallen in and somewhat overgrown with trees, three brick piers, capped with limestone blocks cut at an angle to form the sides of an arch, were visible at the front of the kiln. These were obviously the fire holes and were lined with bricks, the inside surfaces of which were vitrified, indicating that they had been exposed to a considerable amount of heat. Between the top of the arches and the limestone above was a layer of slate – presumably to protect the limestone above from the heat. The southern end wall of the kiln had an obvious opening – presumably for loading. 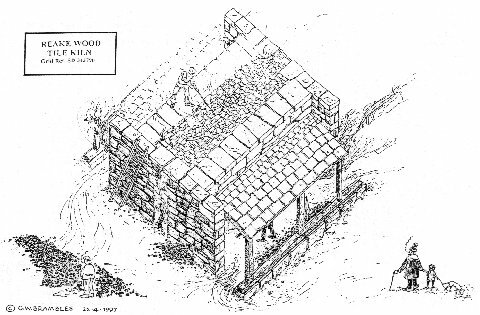 The dimensions of the kiln were found to be approximately 36ft wide by 30ft deep, with brick piers at approximately 3ft centres – the kiln must therefore have had nine fire holes. On the top of the kiln were two depressions indicating areas of collapse, however the interior appeared to be more or less intact and empty. Careful clearing of one of these depressions revealed that the centre of the kiln was a honeycomb structure of bricks upon which, presumably, the tiles were stacked for firing. Later (1996) excavation along the back wall of the kiln revealed fire holes which corresponded in position to those along the front wall of the kiln. These findings appear to show that the kiln resembled a ‘Scotch’ type, having fire holes which were stoked from both the front and rear of the kiln. Scotch kilns were a type of small kiln used at one time on landed estates and commercial brickyards throughout the country.